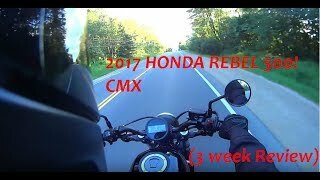 The 2018 Honda CMX Rebel is the perfect entry bike if you are looking to join that Harley / Bobber lifestyle. Watch and learn. 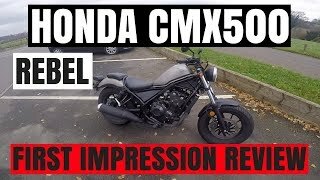 The 2018 Honda CMX Rebel is the perfect entry bike if you are looking to join that Harley / Bobber lifestyle. In general, you are right. But I think for legal issues they needed to keep a front fender on it. Berlin Biker correct me if im wrong but i thought bobbers had no front fender and a bobbed or half back fender? it is going to be small for you, it felt small for me and I’m 5’8”. I would recommend to go to the dealer and take it for a spin, see how it feels. How's the front fork doing also the shocks at the rear. Hey there! I only had the bike for a few days so I’m not sure I can answer this. I’m assuming they are built pretty well. I think it might be a bit small for you honestly. I felt big on it, and I'm 5' 10" and 170, plus that engine is basically straight out of a lawnmower. Does it have hazard lights? Howdy Berlin Biker, as you might remember I'm coming over to visit my parents in Berlin in June and I was wondering if you know of any places where I could rent an A2 motorcycle (except Cintula). Thanks for your help. KTM GST Berlin has a large rental fleet. Check them out. Rebels are like the Civic: reliable, sort of peppy and sort of fun ... good for city and a bit of highway. Not the best at anything, but not bad. In fact, surprisingly fun and practical considering the price. With Honda you get a lot for your money. Too bad Toyota doesn't make bikes. 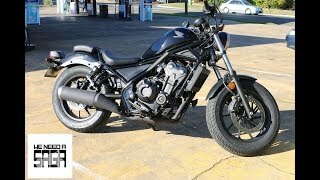 I would love to see more car manufactures venture into the motorcycle game. Hell, shocked Ford or Chevy have not bought Harley yet. 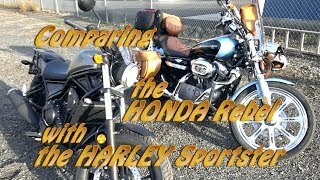 Actually it is a 471ccs and the scrambler sits much higher. It's a clean little get around town bike and would need to be heavily customized to handle highway cruzeing like the bigger models have no problem converting over for that kind of use. But for the price who can complain? So to me it's a nice sporty 450, nothing to brag about, just gets the job done reasonably. I have to be frank here, I have heard better reviewers doing reviews. No thumbs up and hopefully you find a better career path. Hi there, thanks for the comment. While I don’t understand half your points, I appreciate you leaving feedback. As for my career path? That is quite the statement. Don’t you worry about that, I created this YouTube account so I can get access to press bikes to ride. Nothing more. I’m more than secure with my real job. Berlin Biker I got mine at the dealer. They should have pics on the Honda website. Do you have links to them? Would love to see how it looks. Berlin Biker you can buy the rear seat and footrests. Berlin Biker What do you mean? I’ve honestly only seen men ride this bike around Berlin. Don’t let other people’s thought play into what bike you consider. +1990 actually, that is precisely what it does need for overall comfort and spaciousness. Why? It would open up the cockpit a bit more, making it feel a bit bigger. That is precisely what it doesn't need. I don't know exactly where that is, but that area is beautiful. So clean and neat. love the review! You're too funny. I'm 5'0 even. Do you think i'd experience all of the leg cramping issues you were experiencing? I have sat on the Triumph twin street (i think that's the name) and I could nearly flat foot. Oh the Triumph Street Twin is a lovely bike! Back to the Honda, I think at 5 even you would not experience the cramping at all. 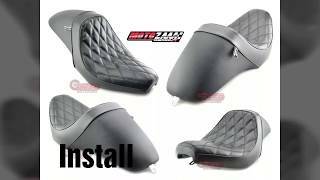 Have you been able to sit on one at the dealer? I think it’s a much different sensation of riding with both your legs up vs. sitting on the showroom floor with your legs up. If my translate is right, how is it? Enjoying the bike? Would I hate myself if I sold my Bonneville SE and got this? I'm in da city, even to get to the country, i go through a city or two. Thinking about going a little lighter.... thanks, man! claud Talkz oh that’s tough. My gut feeling? No. 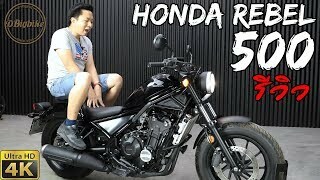 You would be really upset if you got rid of your Bonneville SV, while the Honda is nice there is a lot from a bike (2x more expensive) that you would miss. Yeah, my motorcycle has one, but I think they're only selling it in Asia online. https://shopee.ph/search?keyword=shock%20lifter. Jake W I wonder if someone has made one yet for it? Solid advice. 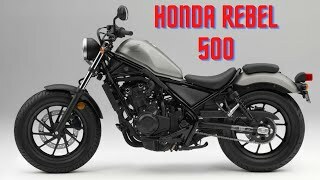 If you want a bike to go to and from work, I would get the CB500x. 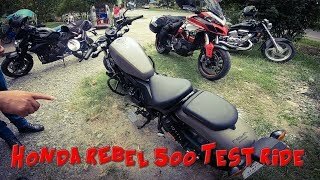 The Rebel 500 is nice, but if you were to wear a backpack or something like that it might be a bit uncomfortable. Plus no windscreen. 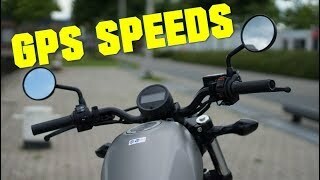 The CB500F is a solid in-between choice. 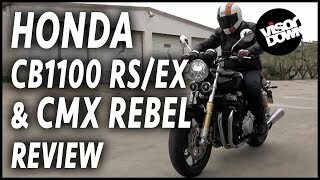 But, at the end of the day you have to buy what excites you, if you like the Rebel 500 you will make it work to your needs. Berlin Biker i'm 1.73m do you think its a confortable bike for our height? 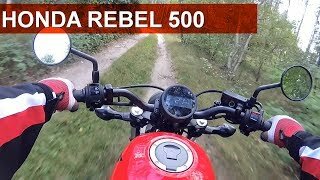 In my town i dont have any rebel to test ride. Hey there! I'm about 1m72 / 5 Foot 8"
hey guy ! how tall are you ? 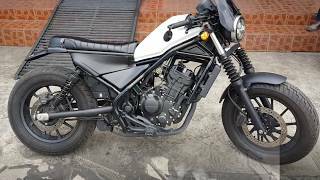 I want to buy this bike as my first one but im 1m83, not to high ? -l Specs l- hey there! I’m 1m72, and felt a bit big for the bike but this was my first bobber that I rode so it could just be what I feel comfortable on. My best bet, head to the dealership and take a sit on it. See how comfortable your hips feel with the angle and see how your lower back feels keeping yourself up and forward without a lot of support. 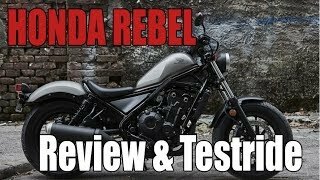 gracias amigo, great review and this motorcycle Honda rebel 500 is perfect for me 5.5 tall short guy, and new rider at 63 years old. Be safe out there! Rubber side down. I got my 2018 honda mcx 500 And my driver license endorsement today is my second day riding just around my neighborhood, I need more practice. Thank you amigo. Bernabe Campos first off, congrats on becoming a new rider!! Super excited for one more person in the world to be on a bike. 5’5” to me is a perfect size for this bike! Keen on riding, be safe out there! Good review. Still looking for someone who is 'vertically challenged' to review this bike. Most reviews are from tall-er riders. Mario Svalina I’m pretty short for a guy? 5 foot 8. But, I felt really big for this bike, honestly unless you are sub 5 foot tall, this bike will work great. Hopefully getting this off your chest make you feel better. Have a good day buddy. I agree; clunky gearbox, pencil thin saddle, and the crankshaft casing digs in to your right shin. Plainly they didn't do road testing before they put it on to the market. Honda douce bags, your not getting my money, when you employ morons in your R and D dept. sandydenny lives valid points, but compare it to things in the sub-5k price range. All bikes at this level have issues, that’s how they led them so cheap. It shouldn't have come to the market with these issues in the first place. Didn't the road testers see this? I don't want to get off the bike after an hour or two with back ache, I buy a cruiser for all day comfort. +sandydenny lives what do you disagree about? 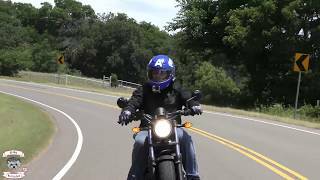 The bike is a good start for a smaller cruiser (people like you who are too small for an entry HD) but there are some issues to address (crankcase and comfort). Obviously learning from this the next version will be better or the aftermarket scene will take advantage of these issues. I disagree. I can accept I'm too small for an entry HD,but at least it had a comfortable seat. 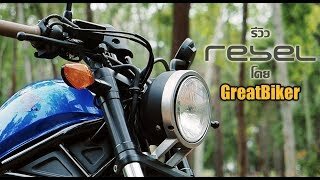 The rebel was ideal for me but I couldn't get over the seat and the plain idiocy of the crankshaft casing. I think what they are going for is great, light and cheap Harley-ish bike. I think there needs to be some fine tuning before the next generation of the bike but a solid start. The cruiser bike landscape has changed somewhat in the last couple of years , when manufacturers started putting efficient water cooled sports bike motors into cruiser bikes. 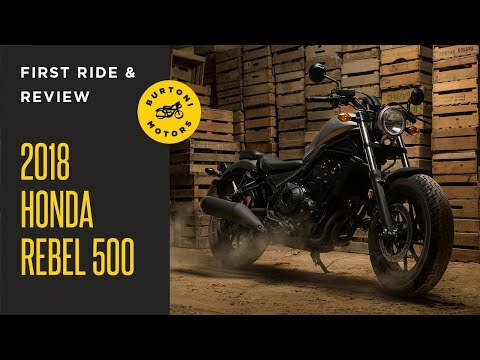 More responsive & more power from smaller lighter engines , like this bike & bikes like vulcan S & HD street 500-750s I predict this trend is not going away. Selling bikes to guys who don’t wanna ride what their grandfathers rode. My father was shocked and couldn’t understand why I didn’t want to just take his 550 pound, 30 hp 76 360. Completely agreed. 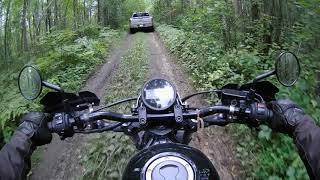 The smaller cruisers are nice because it opens up this sort of riding and the lifestyle associated with it to people who were afraid of the 350kg Harleys that we all know. I want people to know exactly what I’m thinking during a first ride, not everything is perfect on a bike. 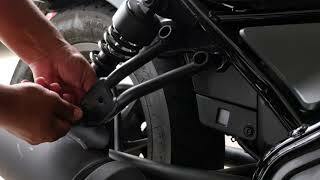 That’s why there is a place for the world of aftermarket products. Appreciate the comment! Hopefully you found it useful!